Founded in 1971, SPLC claims to be a nonpartisan civil rights law firm. But it receives funding from leftist groups, including ones controlled by billionaire George Soros. And a review of Federal Election Commission records reveals that its board members have contributed more than $13,400 to Hillary Clinton’s presidential campaigns. Bader says SPLC has an agenda to derail the Trump administration before it starts. “These flawed SPLC reports will be cited by left-wing special interests to try to block the confirmation of moderate and conservative people to posts such as attorney general by falsely making it look like America’s schools and streets are pervaded by bigotry,” Bader said. 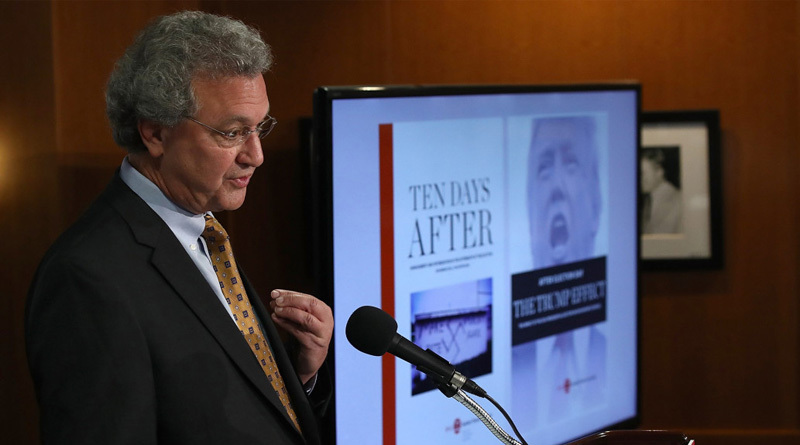 Last week, SPLC held a press conference in Washington to demand Trump “reconsider” his picks for White House advisers and attorney general, and “disavow” his immigration policies. Cohen tied Trump to a number of hate crimes, which he warns will only “spike” once he’s inaugurated. He noted his center recorded 867 alleged anti-immigrant, anti-Muslim and anti-black hate crimes in the 10 days following Trump’s Nov. 8 win. But the SPLC acknowledges that it has not independently verified any of the claims. It collected most of them on its website, many anonymously. “We wrote back to every submission that provided an email address to express sympathy and encourage them to report the incident to local authorities,” Bokenkamp said. Bader pointed out that most of the anti-minority “hate crimes” and “hate incidents” cited by SPLC do not legally constitute hate crimes, and many involve constitutionally protected speech. “It is simply ridiculous that SPLC treats ‘build the wall’ as hate rhetoric,” he said. The center counted people mentioning “build the wall” as 467 incidents of hate. While there no doubt are legitimate reports of hate crimes against minorities — and even one is too many — hyping such incidents recklessly fans the flames of anxiety among such communities. And suppressing reports of crimes against Trump supporters gives a one-sided and misleading view of post-election discord.